In 20th century, the most important advance in the bank security was the electric alarm system. These alarms were sometimes connected to a central monitoring location by telephone lines, but they always included a timer to disable the alarm at a predetermined time in order to avoid false alarms. Alarm Timers for the earliest electric alarm systems are often confused with time locks used in safes and vaults. 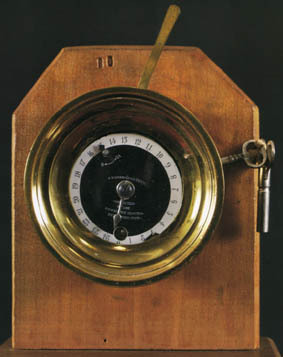 However, alarm timers such as this 1890 model from the New Heaven Clock Co. are easily identifiable by their lighter insulated construction, single movement, and set of electric contacts. The electrical contact on this early design is visibility extending from the top of the case. When the 24 hours timer runs down, this electrical contact will move from the left to the right (as shown), at last, the alarm timer disconnects the electric power of the alarm system. If you would like to know more about Alarm Timer, this is a nice book. The photos are big, sharp and clear.